Dr. Gwen Adams earned a PhD at the Maryvale Institute in Birmingham, UK, for a multi-disciplinary study on priest-parishioner relationships in the field of pastoral theology (Supervisors: Dr. Catherine Kavanagh, Rev. Peter Stravinskas, Dr. Catherine Knowles). She earned an MA in Catholic Studies from the University of St. Thomas, MN. Her master’s level work concentrated on the formation of worldview, the role of literature, and the writings of Alasdair MacIntyre (Supervisor: Rev. Michael J. Keating). 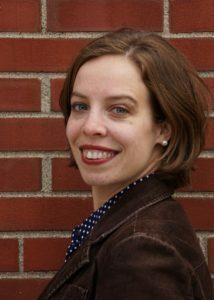 MacIntyre’s work also figured largely in her PhD research as she explored priest-parishioner relationships from a Thomistic-Aristotelian perspective. She is conversant with social science methods, past history and current religious research on the Catholic Church in the United States, and the challenges to priestly formation and support in the 21st century. She is Writer-in-Residence at St. Boniface Catholic Church and serves on the board of the Aquinas Education Foundation at St. Thomas Aquinas Catholic Center at Purdue. 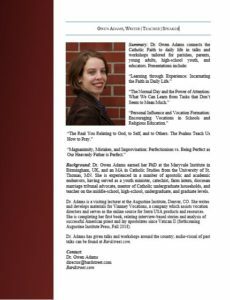 Dr. Adams is a visiting lecturer at the Augustine Institute, Denver, CO, and has ten years of experience as a teacher and catechist. She has presented at the Center for Ethics and Culture Conference (University of Notre Dame), the Symposium on Advancing the New Evangelization (Benedictine College), the Diocese of Burlington, the Diocese of Superior, and other locations around the country. 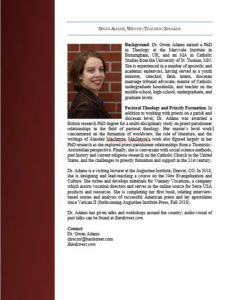 Dr. Adams’ work has appeared in the Church Life Journal, Faith and Culture, and The St. Austin Review. She has developed curriculum and materials for Vianney Vocations. She is completing her first book, relating interview-based stories of successful American priest and lay apostolates since Vatican II (forthcoming Augustine Institute Press, 2018). Dr. Adams has been helping people complete significant projects for more than fifteen years. She has mentored writers, from fourth grade through doctoral candidates. She has coordinated and overseen parish festivals, youth retreats and summer camps, and academic residential programs for youth and adults. She was a 2005 winner of a $5,000 grant from Tippecanoe Arts Federation to produce street theater events and has directed a number of plays, including Hickscorner (2012, 2001); Life Is a Dream (2012, 2001); A Midsummer Night’s Dream (2005); Commedia dell’Arte theater “The Flower of Beauty” and “The Secret Room” (2005); The Other Wiseman (2004, 2003); and Uncle Vanya (2003). "Gwen Adams is one of the most skilled and effective teachers I know. Whether she is presenting a single lecture or an entire course, she has the ability to frame her material so that what is most important is always at the center, while what is most accessible and attractive comes to the fore and gives the students a vibrant experience of learning. Gwen’s speaking and conversation is every bit as engaging as her writing, which is to say, warm, colorful, and deeply purposeful." "I enjoyed the workshop very much. You motivated me to be more creative and gave some great, concrete ways to be more effective in my class presentation." "The reviews weren't just positive - they were filled with effusive praise! The students found you relatable, entertaining and substantive. Many thanks for doing an excellent job!"